Available with every car rental! We want you to get the most out of your rental. Unlimited miles with every car you rent from us! 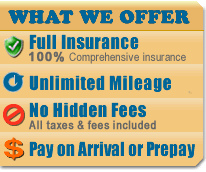 All taxes and fees are included in your rental so you never have to worry about any hidden charges! Your rental contract allows you to have one additional driver at no extra charge.